Ah, Tax Day. Thanks to Benjamin Franklin it will forever be linked with death, but oddly enough it also inspired the creation of an excellent classic cocktail: the Income Tax. 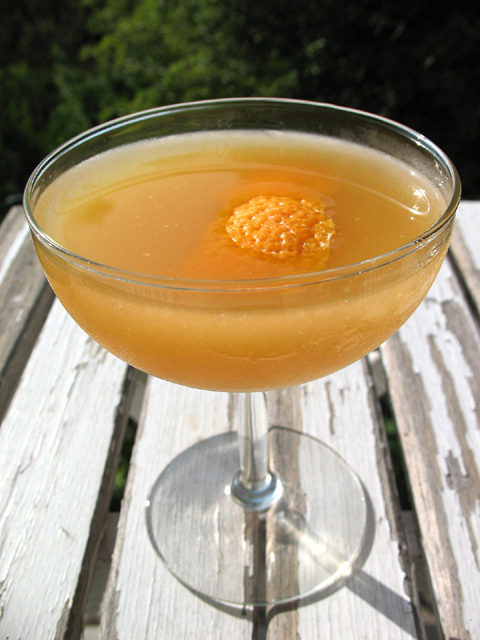 According to diffordsguide, the Income Tax cocktail is a variation of the Bronx (a Perfect Martini with orange juice), with the addition of a dash of Angostura bitters. And if you’re like me, it will be more than just a dash. Whether you’re toasting a nice refund, or lamenting another pound of flesh that Uncle Sam has extracted from you, the Income Tax is a perfect drink for the spring. Or summer, for you late filers. I used Death’s Door Gin (see review) for my Income Tax, and it worked really well. That’s right, Death and Taxes, together again for the first time. I’m eager to try an Income Tax with the upcoming Beefeater Summer Gin (see tasting notes); I imagine its sweet, floral profile would add an entirely new dimension to this cocktail. For a how-to demo, check out the Small Screen Network for a video of Robert Hess mixing an Income Tax Cocktail.